The dragonspyre pirate: Post number 200! Tips and tricks, recap, and more! Post number 200! Tips and tricks, recap, and more! So, this is my 200th post. I didn't really know how to start it off. I am human just like you after all! Unless you are a robot, if so can I join you? Anyways, just like the title says there is a bit of everything. So sit back, relax, grab some hot chocolate and enjoy. Tip 1: Make some friends who are official bloggers or unofficial. Honestly, having friends who have blogged longer than you really helps. They can tell you how to improve and what you are doing right! If they are official they might advertise you a bit (try not to force them to often) and that could certainly help you gain a following, but remember this you aren't friends with them just for help and views, you are friends with them because like you, they are bloggers and need your support just as much as you need theirs. I'm friends with a few official bloggers, and while I may ask for a retweet here and there I still interact with them whenever I can and support them. They aren't there to me for views, they are my friends just like any other. Tip 2: Advertise wherever you can! If an official site has a blog list, apply to advertise there. If someone is retweeting blogs, tell them yours, and most importantly, advertise yourself. Honestly, even with me being on some blog lists, most of my views are from twitter and me announcing new posts. So don't rely on others, you are most likely going to get more views just advertising yourself. Tip 3: Listen and respond to the community. The community looks at your blog, if they see something they like respond and say thank you, and do it more often, if they don't like something, listen and change it in the future. And always be open to criticism, as long as its constructive. For example my pvp gear guide didn't do so well, I admit it there are flaws, but I listened to the community, and responded. I haven't done any pvp posts since, because I don't feel like I've improved enough. And even if people do criticize you, don't be discouraged, try something different. And always be respectful to your viewers, even if you disagree at least argue in a civil manor. Like a debate. Tip 4: Do something different. A blog usually has its own theme for posts. Mine for example are theories. If you do a blog on something a ton of people do, and then submit it, its probably going to be rejected, or if you do something that clearly someone else has the market on, like decorating and Paige Moonshade, you will probably get rejected as well. So offer something that hasn't been offered before! Tip 5: Have fun. Honestly if you are not having fun blogging, this is not for you. You should be having fun, and thats that. Tip 6: Its okay to take a break from blogging. Again don't have to explain this much. Real life is more important, and it always should be. Tip 7: Not everyone is good at writing. And this is by no means bad, it just means you should practice more. Writing isn't something everyone is good at, its like music, you don't just learn to play violin over night. So be sure to practice and learn to write professionally! I started blogging in February of 2016. I've really come a long way haven't I? My blog used to be a mess, not really any way to look for old posts except look through every one, a pretty bland template, and things like that. But over these (nearly 3) years I have had a lot of help. From bloggers gone (like the nordic champion) and bloggers still around like Edward Lifegem and Autumn Dreamwalker. Thanks to them my blog looks like it is today and has become successful. It does seem like forever ago though. In 2016 I made 100 posts, in 2017, only 14 since real life came up and so far this year 86 including this one. In march of 2016, I did 35 posts, Never think I'll break that. This recap may be a bit sketchy, but thats because honestly, time just went by. I never saw this blog as a pain where I count the days, I saw it as and adventure where time doesn't matter. I really do hope that continues and I can blog for a lot longer! I planned to do a party or giveaway, but thats not really me. I like to host parties but they are hardly ever successful, giveaways are the same. But still, I want to do something. So what? 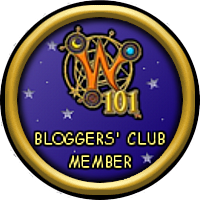 How about this, If any of you want to start a wizard101 or pirate101 blog, I would be happy to help you, and if you already have but need advice I will help as well. I won't promise to endorse you for personal reasons, but if I can I will try. And before you ask, thats blogs only. I don't really promote many streams unless they are from friends I have known awhile and know won't cause drama. So once again thank you for viewing and cya in the spiral!